Current political news often makes for the best Halloween costumes. 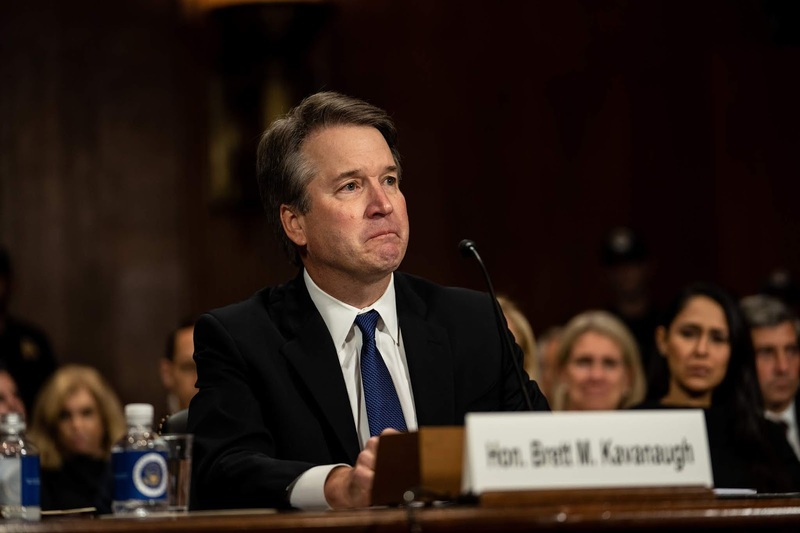 Due to the scandal surrounding Supreme Court nominee, Brett Kavanaugh is sure to be a hit costume this Halloween season. To dress up as the now Supreme Court Associate Justice, throw on a black robe and be sure to carry the infamous wire-bound calendar. Go as a couple by dressing up as Christine Blasey Ford. 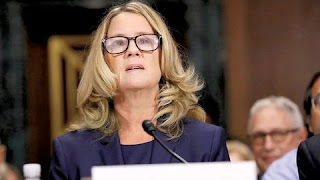 Visit How to make a Christine Blasey Ford Halloween costume. For other political costumes, visit Presidential candidates make great Halloween costumes. Use the Gorilla construction glue to place the pyramid post topper on the top of post. Alternatively, you can place a bird house on top of the post. Add up to 4 bird feeders and / or a wooden birdhouse as shown. Popular Easter egg designs will include those characters from Disney’s hit animated movie, Frozen: Princess Anna, her sister Princess Elsa, Kristoff the outdoorsman, Olaf, Sven the reindeer and Hans the handsome royal. Instead of purchasing the typical and costly Disney Easter egg coloring kit, be unique and decorate your own. To begin, boil the eggs and let them cool. 1. Start with Elsa’s hair as this is a large part of the egg. Cover one side with brown paint or marker for the back of her head. Then, draw several slanted lines down the front of the egg forming Elsa’s bangs. 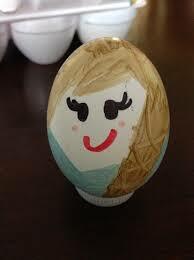 To create Elsa’s “braid”, make criss cross X-shaped patterns in the lower brown portion of the egg. 4. For Elsa’s rosey cheeks, use pink marker or paint to form two smaller circles. Once Princess Elsa’s hair and facial features are complete, prop Elsa up in a cardboard egg holder or use the caps off of 12-16 oz water bottles as a base. To decorate Disney Frozen's Olaf the Snowman Easter Eggs, visit How to make Olaf the Snowman Easter eggs. Popular Easter egg designs will include those characters from Disney’s hit animated movie, Frozen: Princess Anna, her sister Princess Elsa, Kristoff the outdoorsman, Olaf, Sven the reindeer and Hans the handsome royal. 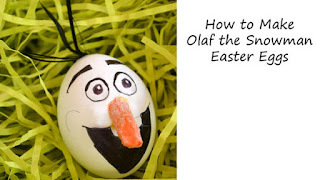 Instead of purchasing the typical and costly Disney Easter egg coloring kit, be unique and build your own snowman … Olaf! To begin, boil the eggs and let them cool. Gather several baby carrots, clean them and then cut one end off at a slanted angle. If desired, thin the baby carrot into a pointed nose shape using a paring knife so that it fits Olaf’s face. 1. Download the Olaf face template available here. 2. Print the template (use zoom in feature for a smaller version) to fit the egg. 3. Cut out the pieces of Olaf’s face (eyebrows, eyes, mouth) and tape the pieces onto the egg. 4. Trace each piece using a pencil and then remove the taped pieces. 5. Color in the design using black Sharpie markers. Finally, cut a black pipe cleaner into 3 pieces and then glue the pieces to the top of the egg. If preferred, one can make a 3D stuffed Olaf carrot nose instead of using carrots. Visit Howto Make an Olaf the Snowman Halloween Costume for detailed information. Popular Valentine’s Day gifts and exchange cards will include those characters from Disney’s hit animated movie, Frozen: Princess Anna, her sister Princess Elsa, Kristoff the outdoorsman, Olaf, Sven the reindeer and Hans the handsome royal. 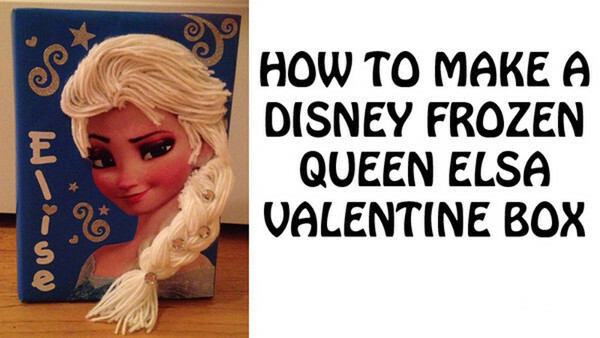 Instead of purchasing the typical and costly Disney Valentine card holder, be unique and build your own snowman … Olaf! To begin, cut a hole in the top of the box. Then, wrap the box in white paper, cutting around the opening just made in the box. If desired, cut small squares of tissue paper, scrunch up and then hot glue the squares to the box. 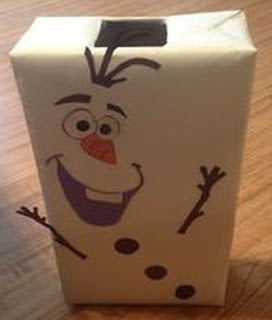 These scrunched up squares of tissue paper will give Olaf a 3D, soft and fluffy look. Using this template, cut the black, white, black circles out of foam. Layered, these pieces will form the eyes. Cut the circular nose out of orange foam, mouth out of black foam. Arrange the cut foam pieces on the front of the box as pictured. Glue the foam pieces into place using hot glue. Be sure to add the child’s name / photo to the top of the box so children will know who’s creative Valentine Box it is. To complete the theme, purchase Disney Frozen Valentine exchange cards at Amazon.com. Prime members receive free 2-day shipping on millions of items! Popular Valentine’s Day cards for this year will include those characters from Disney’s hit animated movie, Frozen: Princess Elsa, her sister Princess Anna, Kristoff the outdoorsman, Olaf, Sven the reindeer and Hans the handsome royal. 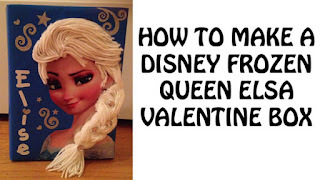 Instead of purchasing the typical and costly Disney Valentine holder, be unique and build your own! To begin, cut an opening in the top of the cereal box. Then, cover the box in colored paper of your choice (cardstock is heavier and will hold up better, but construction paper will do). Print the Elsa face template using a color printer. Cut around Elsa (including the hair) and glue the image to the front right side of the box, leaving room on the left front side for the child’s name. Use a wide object to wrap the yarn around. For example, use a kitchen chair and wrap the yarn around until pleased with the thickness of the ponytail. Slide the yarn off of the object and cut in ½, making 2 long groups of yarn. Set one group of strands aside (this will be used for the bangs). Using the other group of long yarn strands, tie one end with a rubber brand. Braid the ponytail and secure the end with the other rubber band. Decorate the braided ponytail with bling, ribbon, artificial flowers or something more lovely for Valentine’s Day, like hearts or diamonds! Using the other group of yarn strands, cut into strips of various length. Lay the yarn strips over Elsa’s head to form bangs. Once satisfied with the look, hot glue the strands in place. Finish the Frozen Valentine’s Holder by decorating the left front side and back side of the box with sparkle and letter stickers. Be sure to include the child’s name on the box so others know whose crafty creation it is. To complete the theme, purchase Disney Frozen Valentine exchange cards at Amazon.com. Prime members receive free 2-day shipping on millions of items!